Marketing Planning provides an overview of the essential elements of marketing planning with a particular emphasis on the components of the marketing planning process, whilst highlighting the three core themes of environment, strategy and context. The book features an innovative running case study which follows a company through the entire process of marketing planning, stage by stage and chapter by chapter, finishing with a completed marketing plan. Jim Blythe is Visiting Reader at Plymouth Business School. An experienced textbook author, he is Senior Examiner for the Marketing Essentials unit run by the CIM. Phil Megicks is Professor of Marketing and Strategy and Head of the School of Business and Management at the University of Plymouth. He is Senior Examiner with the CIM and designed the Level 6 ‘Marketing Planning Process’ unit launched in 2009. For marketers, planning revolves around what we think our consumers want us to do: we then need to work out how we can profit from meeting their needs. This book is intended to guide the reader through the maze of factors that affect marketing planning, and provides some tools and techniques for implementing marketing planning in practice. 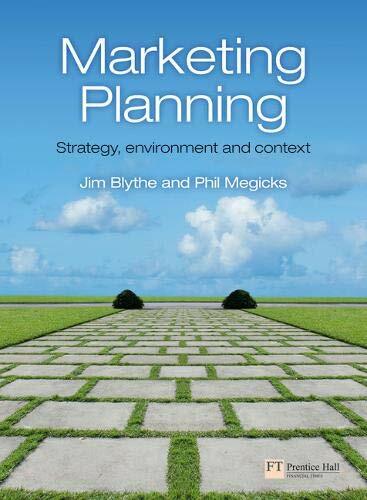 Blythe and Megicks provide an overview of the essential elements of marketing planning with a particular emphasis on the components of the marketing planning process, whilst highlighting the three core themes of strategy, environment and context. The book features an innovative running case study which follows a company through the entire process of marketing planning, stage by stage and chapter by chapter, finishing with a completed marketing plan. Case studies of internationally-recognised companies including JJB Sports, Toyota, Thomson Holidays, BMI, Bulmer's Cider and Honda show how knowledge of marketing planning can lead to more effective marketing and organisational success across a range of different contexts, sectors and industries. Examples in each chapter cover key overarching themes such as innovation, ethics and globalisation to highlight topical issues in marketing today. ‘Talking Point’ boxes are thought-provoking and controversial in order to stimulate discussion and critical thinking. A sample marketing plan provided in the appendix gives students the opportunity to compare their results. · Online resources available at www.pearsoned.co.uk/blythe include an Instructor’s Manual and PowerPoint slides for instructors, along with sample exam questions and weblinks for students. The book is written for the syllabus for the Chartered Institute of Marketing unit on the Marketing Planning Process, and covers everything you will need to study for a marketing planning course at both undergraduate and MBA level. Phil Megicks is Professor of Marketing and Strategy and Head of the School of Business and Management at the University of Plymouth. He is Senior Examiner with the CIM and designed the Level 6 'Marketing Planning Process' unit launched in 2009.